A rock crushed under the Curiosity Mars rover's wheels has dazzled mission scientists in more ways than one. 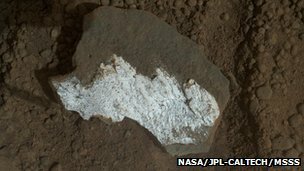 Mars is supposed to be the Red Planet, but the rock - dubbed "Tintina" - is a brilliant shade of white. The unusual colour indicates the presence of hydrated minerals that formed when water flowed through the robot's landing site in ancient times. Water-bearing minerals in Tintina and elsewhere add to the growing catalogue of water evidence at this location. Rover team members have been presenting mission findings at the 44th Lunar and Planetary Science Conference (LPSC) in The Woodlands, Texas. 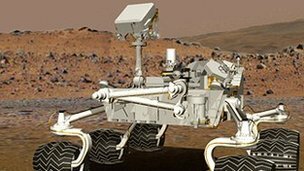 It was also announced that the rover has suffered another computer glitch; Curiosity had already been recovering from a memory problem discovered earlier in the month. The description of hydrated minerals at Gale Crater follows an announcement last week that Curiosity had found clay minerals in a rock it had drilled. These clays indicate formation in, or substantial alteration by, neutral water. That is significant for showing that conditions on the Red Planet could have supported life in the distant past, because many rocks studied previously were probably deposited in acidic water. Speaking here in The Woodlands, near Houston, chief scientist John Grotzinger described Curiosity's landing site as the first truly habitable environment found on Mars. 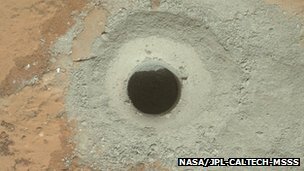 "What we're really excited about is that this is the first time we've been able to follow through with a whole suite of different measurements that really demonstrate the place we found at Gale Crater was a very viable, habitable environment," he told BBC News. Prof Grotzinger added that the team "felt really good" about the Martian location. The one-tonne Nasa rover has been exploring Gale Crater, near the Martian equator, since touching down in August 2012. It drove over Tintina on 17 January, breaking it open to expose the dazzling white interior. "This is one of the brightest and whitest things we've seen with the Mastcam at the Gale Crater site," said Melissa Rice, from the California Institute of Technology (Caltech), in Pasadena. "This rock, Tintina, has a very strong hydration signal that corresponds to all that white material we see inside the rock. But that hydration signal doesn't show up anywhere else in the image. "The first time we tried to take the image [of Tintina], it saturated the detector, because we had no idea we'd have something so bright," said Jim Bell, from Arizona State University in Tempe. Using filters on the rover's Mast camera (Mastcam) and an instrument which shoots neutrons into the ground to probe for hydrogen, researchers have detected more hydrated minerals near the clay-bearing rock than at locations Curiosity visited earlier in its mission. Melissa Rice explained: "What Mastcam is seeing is water that is bound in the mineral structure of the rocks. This water is left over from a previous wet era and is now trapped and preserved in these hydrated minerals." The current rover location, a small depression known as "Yellowknife Bay", lies about half a kilometre from the point where Curiosity touched down. Some of the rocks here are criss-crossed by bright features called "veins. "With Mastcam, we see elevated hydration signals in the narrow veins that cut many of the rocks in this area," said Dr Rice. "These bright veins contain hydrated minerals that are different from the clay minerals in the surrounding rock matrix." She said this hydration signal was consistent with hydrated calcium sulphate and the scientists think that the bright material in Tintina and the material in the veins could be one and the same. The observations shed further light on the history of water in Yellowknife Bay: "The rocks were emplaced and then they were fractured and then there was a second period of water flowing through the fractures in these rocks, leaving behind these minerals." Already, Curiosity has seen the remains of an ancient riverbed system at Gale Crater, where water once flowed perhaps a metre deep and quite vigorously. The picture that seems to be emerging is one where sediments were transported downhill from the eroding crater rim into a network of streams that then flowed into a lake environment represented by the mudstone drilled by Curiosity. "We really just landed in a terrific place where we are able to see the cross-sections of rocks and link things up pretty well to understand what the ancient environment was like," Prof Grotzinger told BBC News. "We think it was some type of alluvial fan and we were very near the end of it, perhaps near a body of standing water like a lake or pond." The conference heard that it was likely this water ultimately came from melting snow, at a time in the past when significant water-ice may have been present at Mars' equator. On Sunday, the rover suffered another computer problem forcing it to flip into a "safe mode". The software file error is expected to delay the restart of science experiments by a few days. Studies at the Gale Crater landing site have been on hold since the beginning of March after engineers discovered a problem with Curiosity's computer memory.